Are you all set for a summer flea eggs-travaganza? Did you know flea numbers outdoors peak during the warmer months? This is thanks to the warm and humid weather, which provides them with the optimal conditions for rapid replication and increased egg production. This can only mean one thing… there could be a summer flea eggs-travaganza going in your local park, woodland, meadow and even your own garden, which equals itchy pets galore – yuck! So, where do all these flea eggs come from? Stray animals, infected pets and wildlife, such as foxes, badgers, deers, rodents, hedgehogs and birds, can all act as reservoirs for fleas. They can contaminate suburban, urban and countryside areas including gardens, with flea eggs as they hunt, pass through or prowl the neighbourhood. Where do fleas lay their eggs? Fleas will only reproduce and lay eggs once they are safely on-board a suitable warm-blooded host (e.g. wildlife or your pet). Once on-board, if both male and female fleas are present, egg production and laying can start after just 24 hours. Female fleas can produce up to 50 eggs per day under optimal conditions, meaning the flea population can rapidly escalate in numbers during the warmer months. How do flea eggs get into my environment? Flea eggs are smooth and slippery and easily roll off their host and fall into the surrounding environment. Because flea eggs are only tiny (around 0.5 mm in size) and pearly white in colour, they can be virtually impossible to spot with the naked eye. This means they could be lurking in your carefully manicured lawn, nestled down near the grassroots in your favourite park or on your countryside ramble. How long does it take a flea egg to develop into an adult? Flea eggs hatch into larvae, pupate and emerge as hungry adult fleas. This can take as little as 14 days in the warmer months when conditions are optimal. Once they have emerged, fleas have only a few days to find their next meal. This means they can’t afford to be picky and as your springer spaniel lurches into the bushes after their ball, if they cross a newly-emerged flea’s path, it will happily jump on board and start reproducing and laying eggs. 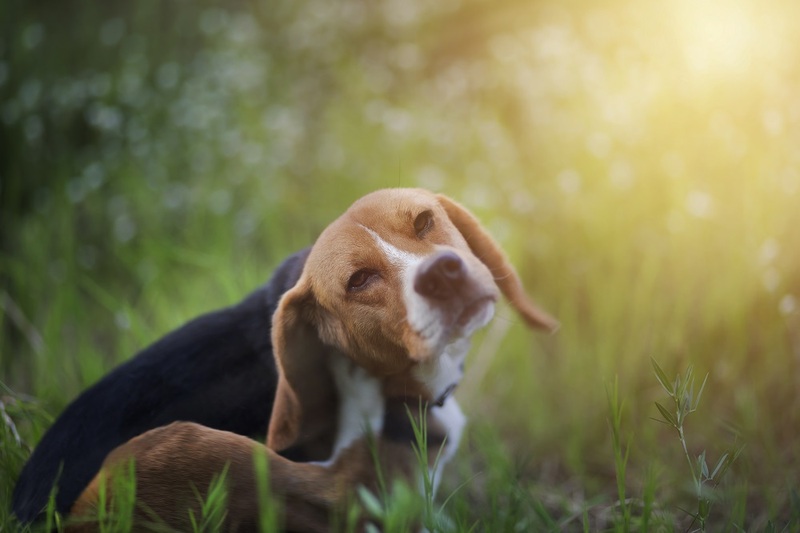 So, how can I keep my pet protected from fleas this summer? During the summer months when there is lots of flea activity going on outdoors, it’s simple and easy to treat your pet regularly using a FRONTLINE® flea and tick treatment. As no product can stop fleas from jumping onto pets, it is normal to see the odd flea on your treated pet, but don’t worry these will be killed by the product within 24 hours. So, stay up-to-date with your FRONTLINE flea and tick treatment and the fear of fleas won’t spoil your and your pet’s fun outdoors this summer. FRONTLINE Plus contains fipronil and (S)-methoprene. UK: NFA-VPS. FRONTLINE Spot On contains fipronil. UK: AVM-GSL. Further information available in the SPC or from Merial Animal Health Ltd, RG12 8YS, UK. FRONTLINE is a registered trademark of Merial. ©2018 Merial Animal Health Ltd. All rights reserved. Merial is now part of the Boehringer Ingelheim Group of Companies. Date of preparation: Jun 2018. PE2594. Use Medicines Responsibly.